BlackBerry was slated to launch BBM for Android and iOS last weekend. But as if the Waterloo-based smartphone pioneer hasn't faced enough challenges recently, its launch was a massive flop. "Last week, an unreleased, older version of the BBM for Android app was posted on numerous file sharing sites. This older version resulted in volumes of data traffic orders of magnitude higher than normal for each active user and impacted the system in abnormal ways," Andrew Bocking, the executive vice president of BBM, explained of the mishap on BlackBerry's blog. "The version we were planning to release on Saturday addressed these issues, however we could not block users of the unreleased version if we went ahead with the launch." Despite this fail—which has yet to be resolved—BlackBerry still decided to show off BBM for Desktop during its BlackBerry Jam Asia 2013. 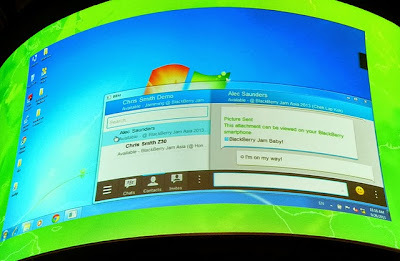 In Hong Kong, Chris Smith, VP of Application Platform at BlackBerry, demonstrated on a Windows PC what BBM will look like for the desktop. The brief demo was not accompanied with any sort of release date. It's also been widely rumoured that a BBM for Mac app is also in the works; again, however, details remain scarce.